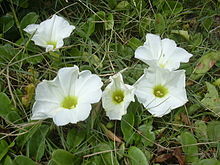 Convolvulaceae, kent commonly as the bindweed or morning glory faimily, is a faimily o aboot 60 genera an mair nor 1,650 species o maistly yerbaceous vines, but an aa trees, shrubs an yerbs. ↑ "Genera of Convolvulaceae tribe Aniseieae". Germplasm Resources Information Network. United States Department of Agriculture. Retrieved 2009-04-13. ↑ "Genera of Convolvulaceae tribe Cardiochlamyeae". Germplasm Resources Information Network. United States Department of Agriculture. Retrieved 2009-04-13. ↑ "Genera of Convolvulaceae tribe Convolvuleae". Germplasm Resources Information Network. United States Department of Agriculture. Retrieved 2009-04-13. ↑ "Genera of Convolvulaceae tribe Cresseae". Germplasm Resources Information Network. United States Department of Agriculture. Retrieved 2009-04-13. ↑ "Genera of Convolvulaceae tribe Cuscuteae". Germplasm Resources Information Network. United States Department of Agriculture. Retrieved 2009-04-13. ↑ "Genera of Convolvulaceae tribe Dichondreae". Germplasm Resources Information Network. United States Department of Agriculture. Retrieved 2009-04-13. ↑ "Genera of Convolvulaceae tribe Erycibeae". Germplasm Resources Information Network. United States Department of Agriculture. Retrieved 2009-04-13. ↑ "Genera of Convolvulaceae tribe Humbertieae". Germplasm Resources Information Network. United States Department of Agriculture. Retrieved 2009-04-13. ↑ "Genera of Convolvulaceae tribe Ipomoeeae". Germplasm Resources Information Network. United States Department of Agriculture. Retrieved 2009-04-13. ↑ "Genera of Convolvulaceae tribe Jacquemontieae". Germplasm Resources Information Network. United States Department of Agriculture. Retrieved 2009-04-13. ↑ "Genera of Convolvulaceae tribe Maripeae". Germplasm Resources Information Network. United States Department of Agriculture. Retrieved 2009-04-13. ↑ "Genera of Convolvulaceae tribe Merremieae". Germplasm Resources Information Network. United States Department of Agriculture. Retrieved 2009-04-13.